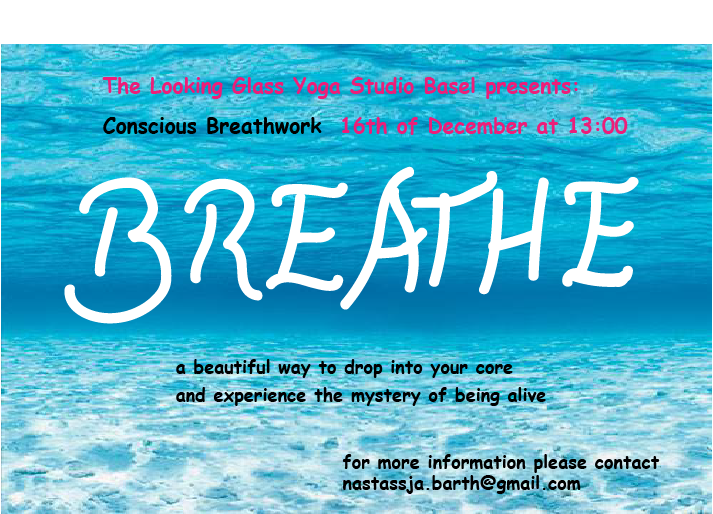 Breathwork is one of the most effective ways to release physical, psychological & emotional stress and tension. It connects you back to your heart and guides you to your true essence. Come and recharge pure air and discover your own power. Please eat lightly and dress comfortable as you will be laying breathing an hour on the mat. Make sure you arrive at least ten minutes early so you have time to settle and we can start on time. bio: Nastassja studied Alchemy of Breath with Anthony Abbagnano and loves to share her passion about journeying inwards with you. On her own healing way she found the breath to be the strongest tool that has already been given to us. Come and enjoy traveling with her into a pure space held with much love and care just for you.